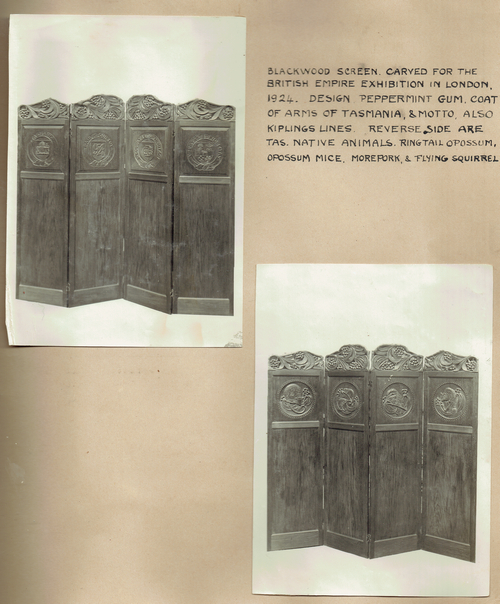 Blackwood Screen exhibited 1924, British Empire Exhibition, London . Who was Nellie Payne? Empire screen in Nellie’s scrapbook. In 1924, the great British Empire Exhibition was held at Wembley, England, and every part of the Empire was invited to contribute an exhibit which would represent and exemplify its particular form of wealth. The Tasmanian Government was not slow to respond, and Mrs. Payne was delighted to receive one day a request from the Conservator of Forests [Mr. L. G. Irby] for an example of her carving. The idea, he explained, was to submit an exhibit which would display to the best advantage a timber that was indigenous to Tasmania; and Mrs. Payne, always eager to advance Tasmania fair, readily agreed. 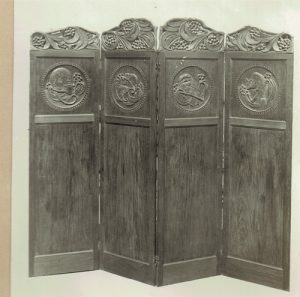 For the purpose she again chose a four-fold screen, but since the intention was to display Tasmania’s timber, there was no leather work and no embroidery. 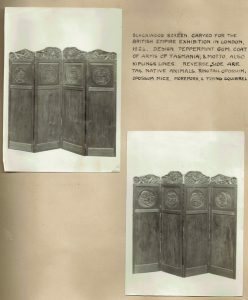 Instead, the Tasmanian timber, carefully selected blackwood, also displayed Tasmanian fauna, for a carved representation of an animal adorned the square panel at the head of each fold. In the first, within a circle, was a ringtail possum, in the next a couple of possum mice, in the third a boobook owl or mopoke, and in the fourth a flying squirrel. That was the reverse side. 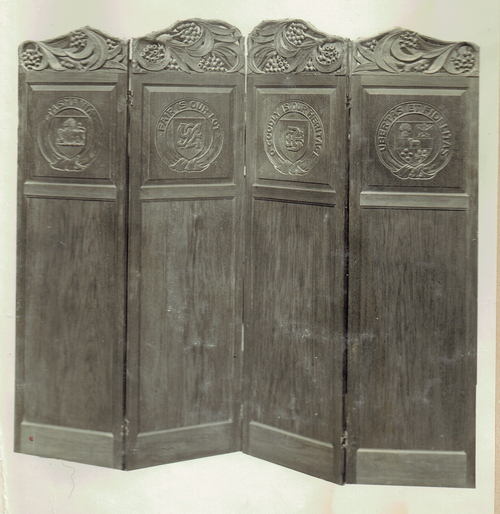 On the obverse sides of the four panels, carved into the highly polished blackwood, were Tasmania’s coat of arms [both aspects], together with the city’s motto ‘Ubertas et Fidelitas’, and Rudyard Kipling’s lines, ‘Fair is our lot, and goodly is our heritage’. The whole was surmounted by a head-piece carved on both sides in a peppermint gum design. 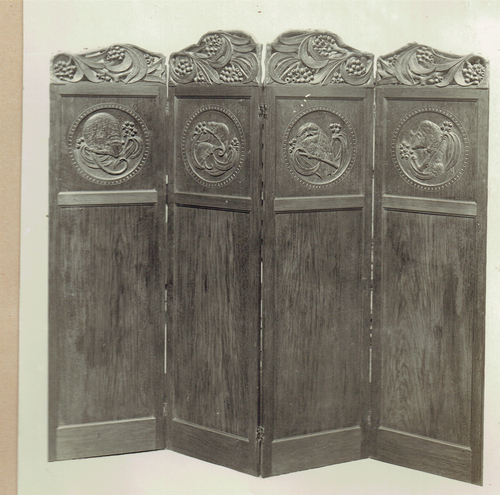 The long lower panels were left unadorned in order to show the richness of the wood. The screen attracted considerable attention at Wembley as long as the exhibition lasted, but when the vast display was nearing its close friends reported that they had been unable to find Mrs. Payne’s screen among the exhibits. They asked what had become of it. Those enquiries aroused some alarm at home, and as the screen was part of the Tasmanian Government’s exhibit the Government sent cables to London demanding that it be found immediately. Several days went by before the mystery was solved. It turned out that Australia’s Special Commissioner for the great exhibition [Sir Victor Wilson] had taken a great fancy to Mrs. Payne’s screen, and, assuming that it was for sale, had resolved to buy it. Indeed, he was so certain of possessing it that, as the exhibition was almost over, he had it removed to his private office in the exhibition building, and there it was at length discovered. Sir Victor, full of apologies, thereupon conveyed to Mrs. Payne his offer to purchase which, he explained, pressure of business had prevented him from making earlier. His valuation of the screen was 500 pounds [$1,000], and that sum he offered Mrs. Payne. But she had no intention of selling her screen, and Sir Victor Wilson’s offer did not dazzle her. She told him quite firmly that she intended to bring it back to Tasmania, and that she proposed ultimately to leave it to her descendants as an heirloom. So she declined his offer, and the screen now rests safely in Bryon Street, Hobart, home of Mrs. Geoffrey Payne. In conveying to you, on behalf of the Australian Commission, British Empire Exhibition, the commemorative medal awarded by the Exhibition authorities, I desire to record the Government’s appreciation of your enterprise. You are one of a total of one hundred and ninety- eight Tasmanians who sent to the Exhibition exhibits totalling in value over 7000 pounds. Tasmanian exhibits have been spoken of very highly, and they were recognised as being indicative, not only of the widely diversified resources of this State, but of the ingenuity of its people. Whatever may be the result of the Exhibition from the point of view of increased trade, there can be no doubt that the State has received a splendid advertisement by means of the British Empire Exhibition. For your share in that advertisement I desire to thank you. 23rd April 1924 Opening of British Empire Exhibition in Wembley, London, England. 1st November 1924 Closing of British Empire Exhibition in Wembley London, England. May 1925 Opening of British Empire Exhibition – ‘The same Empire, but a new Exhibition’ in Wembley, London, England. 21st September 1925 Mrs. Payne receives a commemorative medal for her participation in the 1924 British Empire Exhibition and a letter from Tasmanian Premier J. A. Lyons. October 1925 Closing of British Empire Exhibition – ‘The same Empire, but a new Exhibition’ in Wembley, London, England.